Halloween | Hot vegan chick.....peas! Halloween is my absolute favorite holiday of the year so I always try to do something special. This year we did a bunch of new stuff, which included checking out a new haunted house, trunk or treating, and seeing a special Halloween concert in SF. Trunk or Treat is basically a way for parents to provide a safe space for their kids to celebrate Halloween. A lot of churches do it because it’s an alternative for parents who don’t want to send their kids out to strangers’ houses on Halloween plus they can control how spooky everything is. The parents line up their cars and sit in their Halloween-bedazzled trunks, handing out candy. 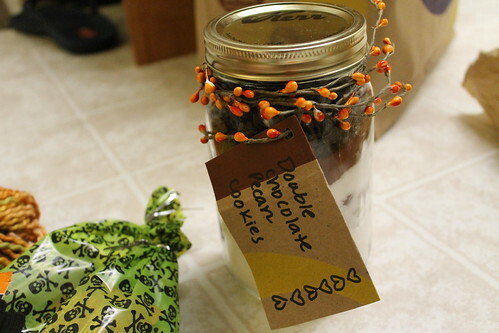 Since everyone knows each other, you can totally make homemade sweeties to hand out instead of pre-packaged candy! I’m usually stuck buying the “boring” (i.e., non-chocolate) candy for Halloween, since the cheap chocolate is full of dairy (and slavery!) and the fair-trade/vegan stuff is way too expensive. 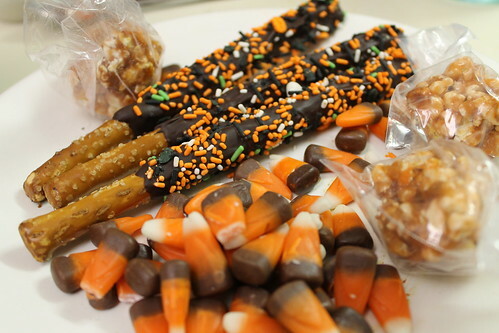 I didn’t have a lot of time to make stuff so I opted for chocolate-covered pretzel logs (with vegan Halloween sprinkles!) and caramel popcorn balls. The next day we went into San Francisco to go see a Halloween performance of The Phantom of the Opera. Of course, if we were in the city we had to check out a new vegan restaurant! 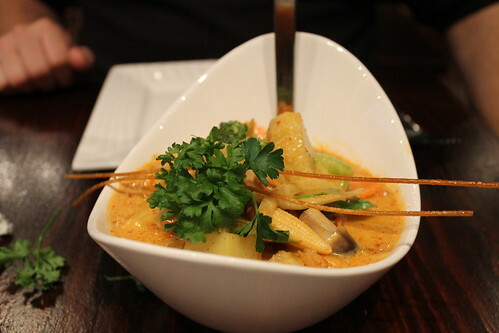 There’s been some buzz on the PPK about a new vegetarian Thai restaurant, Thai Idea. There’s also a good review of the place in SF Weekly. 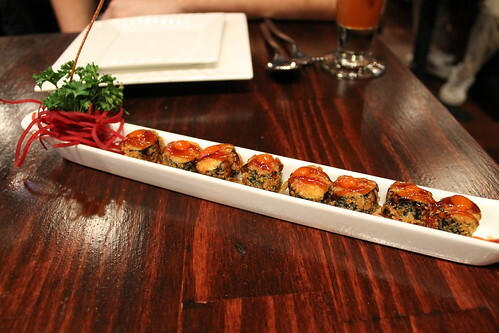 Firecracker balls – they are deep-fried, panko-crusted and nori-wrapped veggie tuna balls. Everything was good! The restaurant was super cute and all the entrees were under $10. The service was really attentive, too. I recommend the firecracker balls. They tasted a little fishy from the nori and they were served with a delicious sweet chili sauce. The Massaman curry was one of the best I’ve ever had (and I’ve had a lot!). 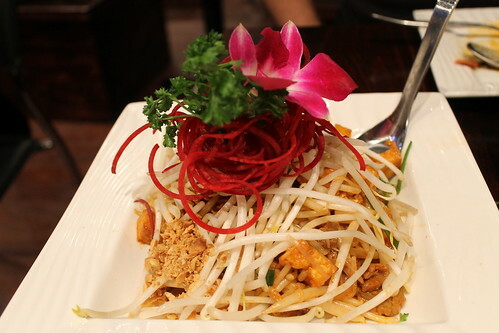 The Pad Thai was just ok…it needed more zip but I’m also really picky about my Pad Thai. We were hoping they’d have mango sticky rice for dessert, but instead they offered deep fried bananas with coconut ice cream. As good as that sounded, I was only in the mood for mango so we passed. 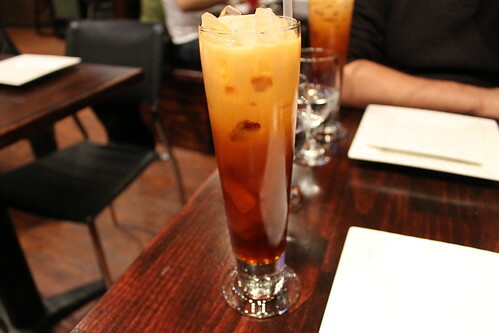 Yay for a great new Thai restaurant (sans fish sauce!) and yay for Halloween! MoFo #21: Vegan Yarn Swap! If you knit or crochet, you’re probably aware of the awesome website Ravelry. It’s like facebook for yarn enthusiasts! You can post your knitting projects, look at others’ projects, download patterns, browse yarn, and chat with other knitters in the forums or common interest groups. There’s even a PPK group on Ravelry! My favorite group is the Vegan for Every Season Swap, which hosts season-themed swaps. I’ve done it three times now and have always had a lot of fun. 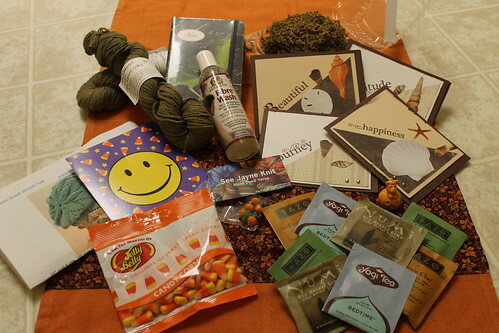 Once you’re paired up with a partner, you have to put together a package of vegan yarn, treats, and other goodies related to your partner’s interests. So there are some Halloween-themed goodies…socks, tea towel, glow-in-the-dark nail polish…and inside those treat bags are the whole collection of Go Max Go bars, Primal Strips, Swedish Fish, and Sour Patch kids (hope she likes candy, haha!). The yarn in the back is really soft fall-colored cotton from Yarns of Italy. 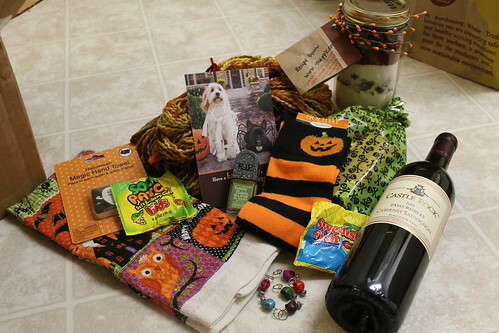 My swap partner likes wine so I sent her a nice local Red, and I also made the cookie jar mix from the PPK. 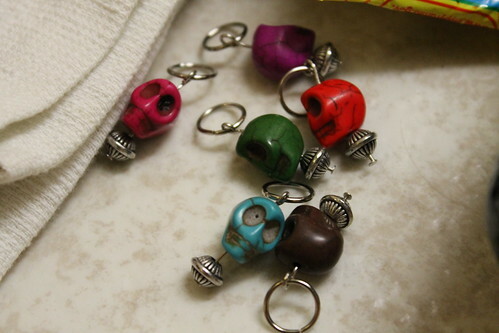 I also made some Dia de los Muertos stitch markers. I wanted to bake some treats for her pet bunnies, which I’ve done in the past, but dang I just ran out of time. Anyway, I hope she likes it all! Here’s the package that came in the mail to me today! -lovely organic cotton yarn from Long Ridge Farm…and some patterns tucked alongside to inspire me! -greeting cards, I think they are handmade, wow! I love these swaps! They’re so fun to assemble and I love getting treats in the mail.